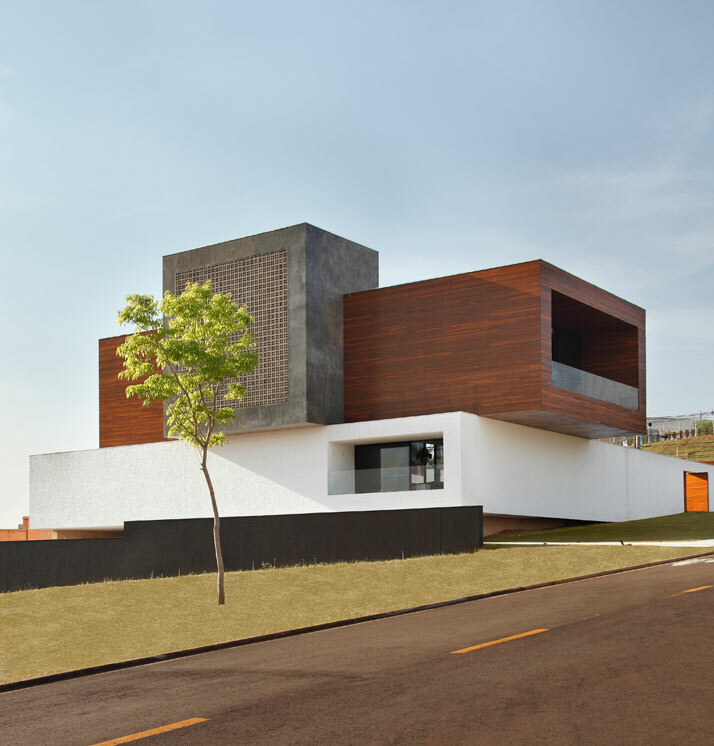 Last time we posted FJ House from Studio Guilherme Torres many of our readers were thrilled, and so we present to you this time another project which will surely interest and inspire many of you out there! 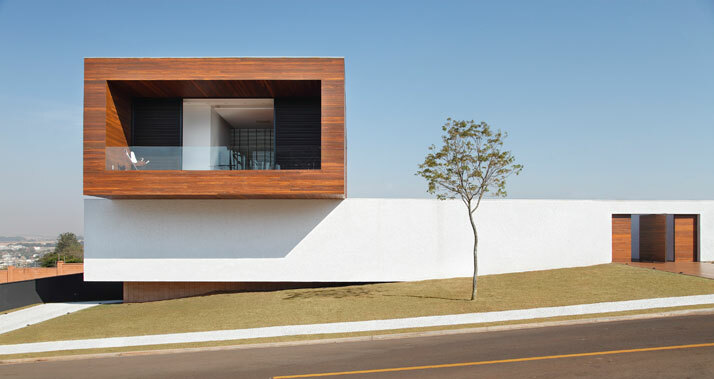 LA House is a 410 square meter house, in three levels, which was completed in 2009; the house is designed for a young couple who wished to eliminate the small spaces and the traditional partitions in the existing condominium in Londrina, Brazil. The architectural concept is to ‘break the paradigm’ as the architect quoted. 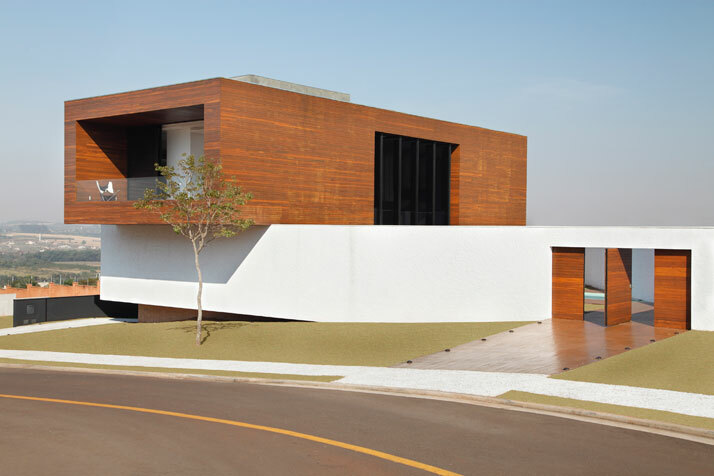 Accomplishing this from the very first look before you even enter the house, a big wooden box of Brazilian teak cumaru wood cries out loud and calls for everyone’s attention; you can see this box whether you are inside or outside the Londrina based condo. LA House is located in the highest point of the Londrina based condominium, this meant that many factors were taken into consideration and a lot of parameters were set due to the lack of privacy. The lack of privacy issue was created based on the fact that the house is located at the highest point of the lot, and also the wide extension of the exterior boundary walls. To overcome this issue Studio Guilherme Torres adopted a solution of creating a ground level plateau foundation, which is surrounded by walls that embrace the whole construction and create a perimeter in-between the condo walls. 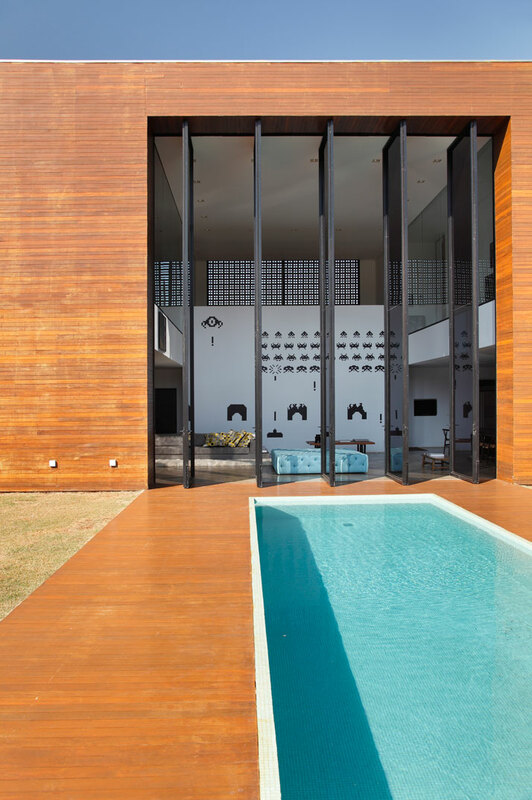 From this premise, the large reinforced concrete box was covered Brazilian teak cumaru wood, creating the most usual part of the site, and thus leaving the lot in a trapezoid shape for the garden and the pool area. 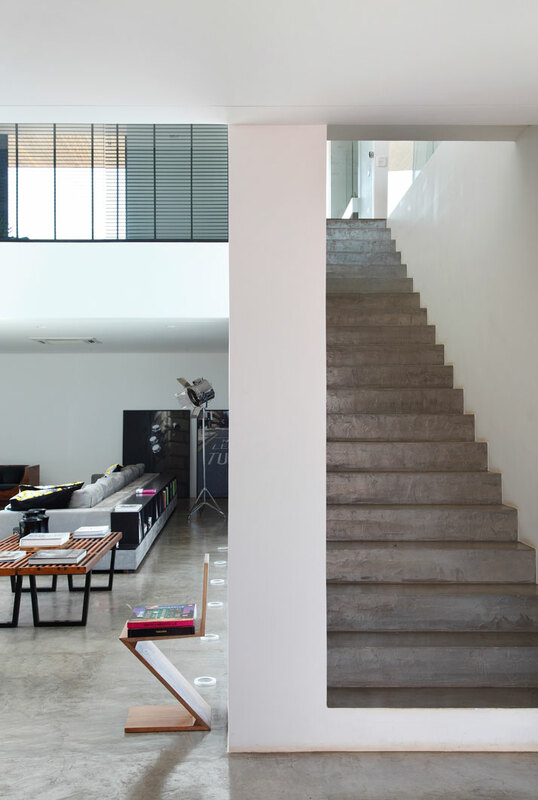 The core concept of LA House is breaking archetypes; such as the small spaces and the traditional partitions although the house is intended for a couple and maybe also for a family; moreover another example of such was given right at the entrance – the entrance gate leads the visitor to walk by the pool and enter the house by the double height atrium which connects the entire house. 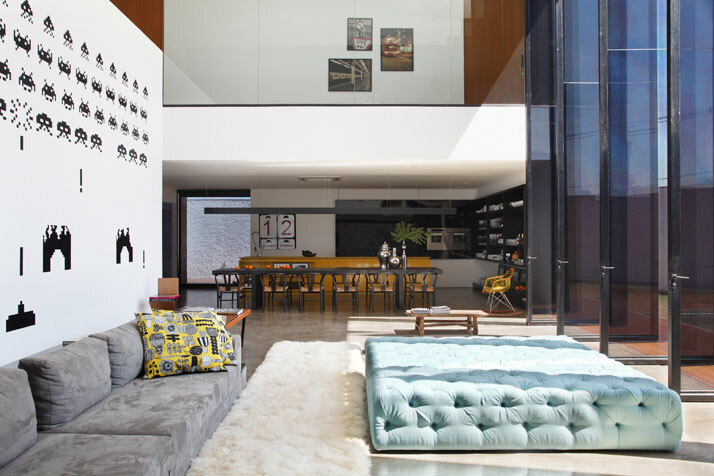 The all-white living room area which is located on the ground floor facilitates the linkage between the inside and the outside by means of large pivoting glass doors. 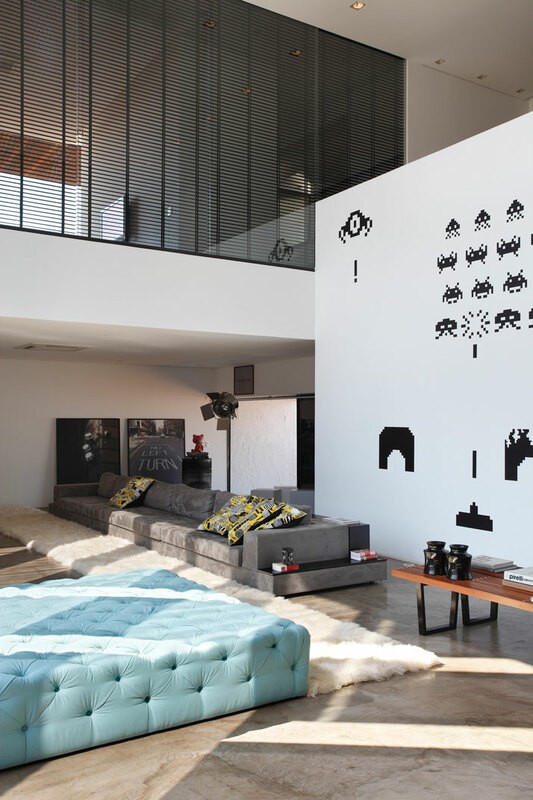 Upon entrance to the living room you come face to face with the 1981 Galaga static arcade game wall, the wall stickers can fascinate everyone as they bring memories of the past to everyone; I can’t believe that there is any single person who could claim that they haven’t enjoyed this or any other arcade game! An oversized sofa in light grey compliments the capitone light blue oversized pouf which totals four square meters and is the centerpiece of this double height living room; a beige flokati shag rug runner scuttles 10meters parallel to the sofa and is frivolously placed on the polymer-cement floor. 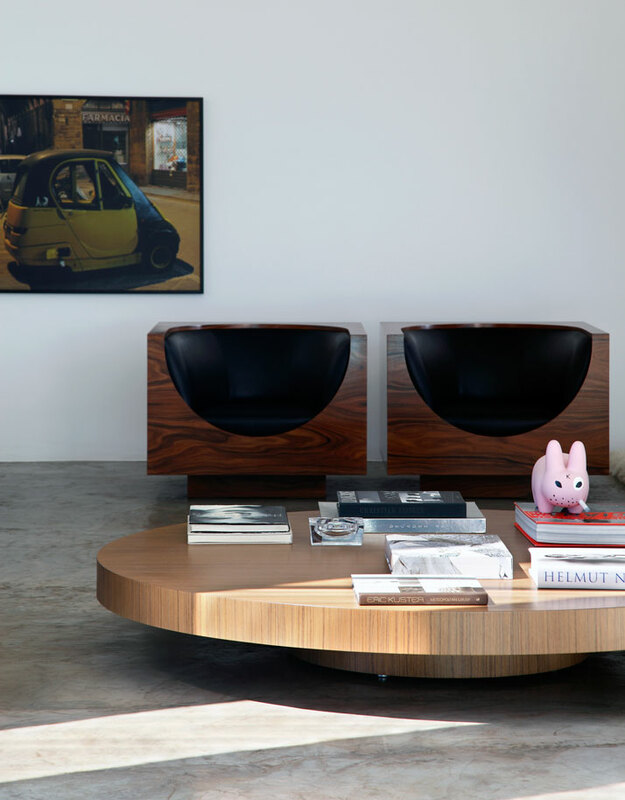 Iconic furniture such as Nelson Platform Bench – George Nelson, Zigzag – Gerrit T. Rietveld, Butterfly/Hardoy chair – Jorge Ferrari-Hardoy, Wassily Chair – Marcel Breuer, and the Cubo armchair - Jorge Zalszupin add the final touches to this magnificent interior. 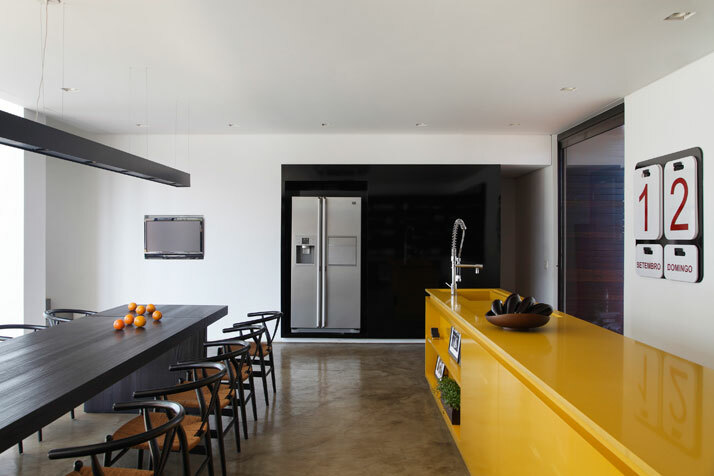 The kitchen is integrated into the open-plan environment, with a niche where stove and even a barbecue was installed. 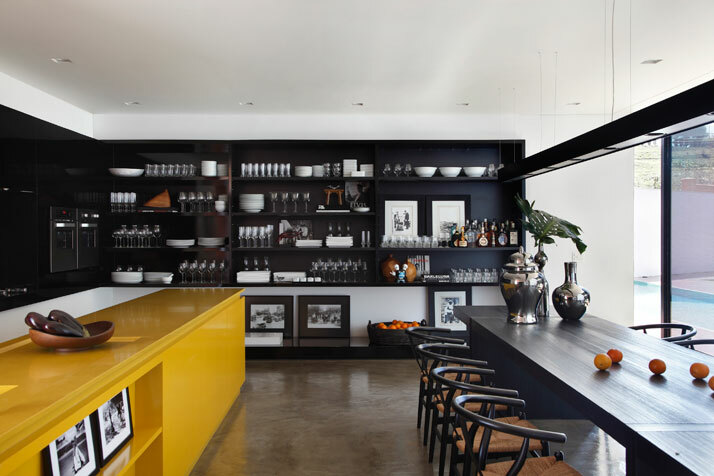 The anthracite kitchen matches well with the yellow free-standing counter and in any case it does not remind us of a conventional kitchen, even as an open-plan. Little accessories and accompanying design elements make the difference! The dining area is perfectly integrated to the kitchen and living room; a custom design table by Studio Guilherme Torres is matched with the 1950 Y Chairs by Hans J. Wegner. 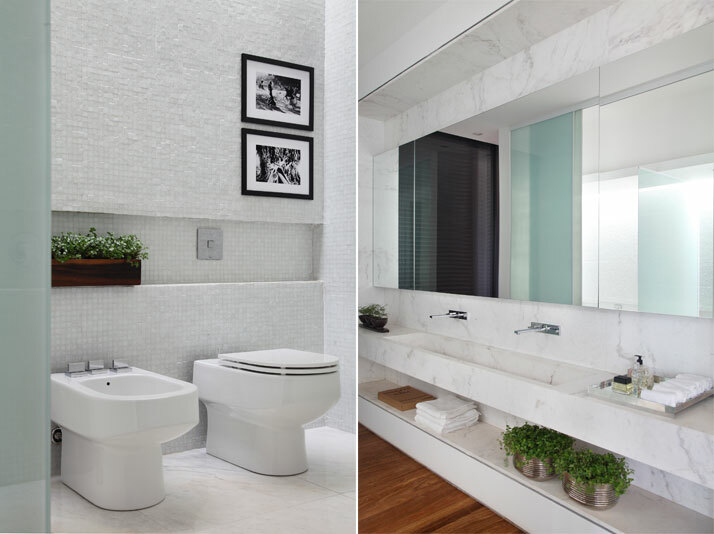 Even the lavatory has been designed in such a way so to work as a pool changing room. The ground floor is connected to the upper floor by an internal straight staircase; once on the upper level where the bedrooms are located the flooring changes to indicate the difference in the program. Wooden flooring replaces the polymer-cement and indicates the difference. The master suite is separated from the living room atrium by a glass wall; the toilet and closet are integrated to the sleeping area.The hall located by the stairs on the upper floor, works as a small office space and has its windows protected by concrete hollow elements. Simple solutions, uncomplicated design and a selection of a few materials which are generously used, confer individuality, character and a timeless touch for this project, showing an uncomplicated, simpler way of living.